Steven Fuller is Yellowstone’s longest-serving winterkeeper. He might also be the park’s last. His photography portfolio will, however, remain a monument to one of the world’s most unique jobs and also to Yellowstone itself. “Most snow in our contemporary world is plowed, piled, fouled, and messed with as it falls or soon thereafter,” Fuller says. “Here in Yellowstone, I have the great pleasure of enjoying snow as the gods made it and as they intended that we should marvel at the perfection of their creation.” Fuller took this photo of snow “dunes” in Hayden Valley in February. In Steven Fuller’s neighborhood, there are a few sacred, unspoken rules his guests are expected to abide by: 1) Don’t deface the landscape, especially when it glitters with a patina of pure virgin snow. Carving artless ski tracks through its middle is almost considered an act of vandalism. 2) Don’t intrude into the space of other animals. 3) Listen more than you speak. 4)Bundle up and wear plenty of layers because even in an age of global warming, it still gets damn cold. Your host, after all, has little tolerance for frostbitten wimps. Fuller sets these rules because he has a deeply evolved understanding of and appreciation for his habitat: the remote hinters of Yellowstone National Park. The front stoop of his pine-shingled cottage overlooks the Lower Falls of the Grand Canyon of the Yellowstone River. His wild neighbors, which vastly outnumber those on two legs, include elk, moose, bison, and grizzly. Winter temperatures often dip well below zero, and upwards of ten feet of snow can bury his front yard, crisscrossed by hoof and paw prints. As far as anyone knows, no human has lived continuously and year-round in Yellowstone longer than Fuller. That includes, some historians say, Native Americans. This is Fuller’s fortieth consecutive season as a winterkeeper, a job—an existence—that is hermetic, to put it mildly. Looking back across four decades, it’s maybe no surprise that when Fuller and his then-wife, Angela, expressed naive interest in the Canyon Village winterkeeper job, they were hired on the spot. They were the only applicants. The couple’s salary was a few thousand dollars, justified in part because where they were living there was no need for material luxuries. A California-born son of a National Park Service ranger, Fuller studied history at Ohio’s Antioch College. He spent two years in Europe, where he met Angela. Angela was born in Britain and, until meeting Fuller, led a cosmopolitan life. Eventually tiring of European cities, the young couple set off for Africa, a continent that continues to pull Fuller back every year. In Uganda, Fuller taught in a Shiite Muslim middle school. He sailed to India and Southeast Asia, the only European traveling in steerage class on his boat. Returning to the States, Fuller interned for The Associated Press, covering the U.S. Senate. He also worked as an emergency-room technician at Massachusetts General Hospital. Then he and Angela made their way to West Yellowstone, Montana, where they spent one winter. The next winter, they moved to Canyon as winterkeepers. As Fuller and Angela were taken to Canyon for that first season, they were essentially told to get lost. Superiors made it clear they didn’t want to see or hear from the two until the plows pushed through in April. Considering the Fullers were a forty-mile snowmobile ride from both civilization and brusque bosses, this was not a difficult directive to follow. If they were to run out of provisions, an old-timer persuaded them they could always poach a deer or elk. Fortunately, that proved unnecessary, though in the early years, they did wonder where they fit into the food chain. Fuller today has a photo portfolio of hundreds of thousands of images of Yellowstone. He has visual impressions of the park’s wildlife and landscapes in all seasons, representing a library that, when it comes to chronicling the more intimate side of America’s first national park, is likely unsurpassed. 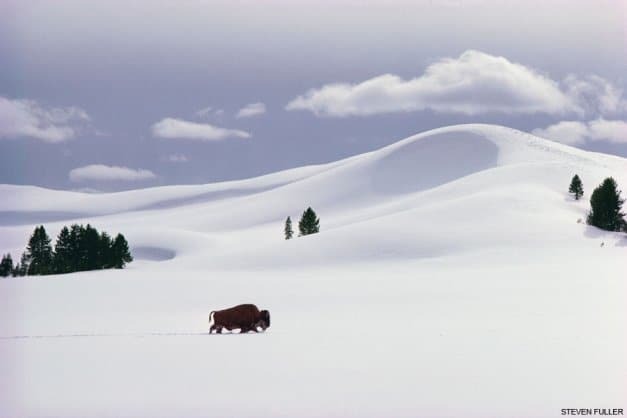 Fuller’s eye and technical skill first gained national attention when his pictures appeared in a National Geographic feature, “Winterkeeping in Yellowstone,” in 1978. The story, unprecedentedly long for the time, made him a bit of a folk hero, albeit a reclusive, hard-to-reach one. He exchanged letters (handwritten, this was long before email) with a cast of characters that included Edward Abbey and Kurt Vonnegut. Institutions around the world—National Zoo in Washington D.C., South Africa’s Endangered Wildlife Trust, and the Royal Geographical Society in London—began to ask him to speak and give slideshows. Fuller’s portfolio remains relatively unheralded in the region. His website, stevefuller.net, only exists because friends set it up. Still, his images may, in hindsight, become as synonymous with Yellowstone as those of Ansel Adams are with Yosemite, the Tetons, and California’s redwoods. Scientists familiar with Fuller say that his photographs are not only fine art, but also invaluable as reference material about the park, serving as a chronicle to geographic change. Fuller aims his camera across vistas—capturing the variegated palette of thermal pools, glowing sunrises and sunsets, the churn of earth-belching mists, and atmospheric clouds—as if they were canvases. “Through Steve’s photographic vision, we all get to experience Yellowstone in a way that few of us will ever witness, regardless of how many times we visit the park,” says Dubois-based nature photographer Jeff Vanuga. Vanuga, who has led safaris around the world and taught and shot with some of the biggest names in photography, says Fuller’s perspective is novel among photographers, past and present. Vanuga instead groups Fuller with nineteenth-century romantic landscape painters like Albert Bierstadt and Thomas Moran—luminists who exalted in portraying panoramas glowing in the backlight of sun, mist, and moon. Fuller himself likens his photographic style to Sfumato, a painting technique used by many Renaissance ar-tists including Leonardo da Vinci. The shading around Mona Lisa’s eyes is Sfumato—areas of different colors blend together, and there are no harsh outlines. (Sfumato comes from the Italian “sfumare,” which literally translates as “to tone down” or “to evaporate like smoke.”) Da Vinci described Sfu-mato as “without lines or borders, in the manner of smoke or beyond the focus plane.” Fuller’s photographs have no hard edges, save for animals in silhouette. Elsewhere, edges retreat into blurs, pulling viewers deep into his scenes. The way Fuller treats landscapes is often in juxtaposition to the landscapes themselves. “I’ve always been drawn to stark, fierce landscapes,” he says, “whether in the sunburned deserts of Africa or the deep, cold, albino winter landscapes of Yellowstone, especially when either is animated by archetypal wildlife.” Animals in Fuller’s viewfinder—and wildlife does frequently appear—are never fierce or imposing. Fuller is not a sharp-focused, headshot opportunist interested in portraying wildlife as trophies. Instead, creatures more often are smallish—reference points for conveying the scale of a vast landscape. In Yellowstone, he has particular reverence for bison. In Namibia, his favorite getaway, he has encountered lions, elephants, rhinos, and hyenas, on foot and next to his tent. Though at opposite ends of the temperature gauge, he craves what these stark landscapes represent: fleeting wildness. At age sixty-nine, Fuller’s short-cropped albescent locks now mirror the winter fur of the ermines living around his cottage. The stout house, which he has lived in since his first winter in the park, dates to at least 1910. Fuller knows this because he once pulled a 1910 newspaper out of the wall; most likely, it had been put there for insulation. The cabin, which hunkers unpretentiously into a hill, sat near the Canyon Hotel until that architectural wonder was destroyed by fire in 1960. (Canyon Hotel was designed by Robert Reamer, the same architect who did the Old Faithful Inn.) The misty Grand Canyon of the Yellowstone is a short distance from Fuller’s cottage, and the thunder of water roaring through the chasm is always in the air, accented often by wind and the calls of wildlife. Today, Fuller is witness to a unique paradox. As expanded tourism and technology—where he once only had a short-wave radio, today there are phones and Internet—have intruded upon his job and isolated winter existence, by some metrics Yellowstone is wilder than it was in 1973. Then-addicted to feasting on trash and in danger of disappearing, the park’s grizzly population is now stable and subsists on a natural diet. Wolves were exterminated from the park in the 1930s. At present, close to one hundred of them now live in Yellowstone. Fuller hears their howling from his front porch. The future of Yellowstone’s winterkeepers is more predictable, and it does not look good. Fuller and Dale Fowler, a winterkeeper since the 1980s and now stationed at Lake Hotel, are the only ones left who still live solo and full time in the park during the winter. There are a handful of other people in the park whose job descriptions call them “winterkeepers” but none emanate as authentically as Fuller and Fowler, witnesses to and survivors of the old school. Whenever it is that he and Fowler retire, Fuller thinks they’ll be the last winterkeepers. New materials used in construction have produced stronger roofs better capable of handling the snowpack, rendering winterkeepers’ shoveling less necessary. And if shoveling is still necessary, contracting out to workers who don’t live in the park is less expensive. Rumors have also been circulating for years that Canyon Village may begin offering year-round services and lodging, meaning it will no longer go into hibernation like the resident grizzlies. In his transcendental classic, Walden, Henry David Thoreau reflected, “I went to the woods because I wished to live deliberately, to front only the essential facts of life, and see if I could not learn what it had to teach, and not, when I came to die, discover that I had not lived.” Fuller’s Yellowstone winterkeeper life is eminently more remote than Thoreau’s. Winterkeepers mentioned in the annals of Yellowstone were an eccentric lot, a mixture of antisocial, hard-drinking libertarians who wanted to get away from people (and suffered occasional mental breakdowns) to hardy, rugged individualists. Yellowstone’s first winterkeeper was George Marshall, who spent the winter of 1880-81 at his Marshall Hotel in the Lower Geyser Basin. By 1887, there were also winterkeepers at Old Faithful, Can-yon, and Norris. Until the advent of motorized transportation—snow planes in the 1940s, and snowcoaches and snowmobiles in the 1960s—there was no winter tourism to speak of in Yellowstone. It was the sole provenance of its winterkeepers. In 1970, the only heated building open to tourists at Old Faithful in winter was a bathroom. In 1971, the first Old Faithful Snow Lodge opened, ushering in the modern era of Yellowstone winter tourism. Today, close to 100,000 people visit the park every winter. Still, Fuller concludes that he is lucky to be alive in this time and place. “The older I’ve become, the more I’ve begun to appreciate the sentient connections between living things here and the places they inhabit,” Fuller says. Standing in his quaint living room, the walls dominated not by his own photographs but row after row of several thousands of books he’s read, Fuller glances out the window. On a clear day, he can see the Tetons, one hundred miles distant. He recalls the day a treasured acquaintance, an old bison bull, died in Hayden Valley. Long part of the neighborhood, the bull succumbed to the elements and old age. Afterward, Fuller watched as another old bull stopped at the carcass for long minutes, appearing to contemplate the lifeless body and the loss. When that bison moved on, the park’s scavengers—coyotes, foxes, and ravens—moved in. They made quick work of the remains. Fuller says people who dismiss this anecdote as groundless New Age anthropomorphizing—he isn’t a New Ager—need to spend more time in nature. He points out there are similar accounts of African elephants saying “goodbye” as he witnessed in these Yellowstone bison. These are the kinds of stories Fuller tells, even though he could be a raconteur, holding forth with tales of harrowing run-ins involving the weather or animals. “You live here, stuff can happen, you accept it, but is it any different, really, from anywhere else?” he asks, saying he prefers his perils—avalanches, hypothermia, being eaten by a bear, getting stomped by a bison—to being run over by a truck while crossing an urban street or dying of a heart attack in an office cubicle. Still, one of his ambitions is to stay out of historian Whittlesey’s classic book, Death in Yellowstone: Accidents and Foolhardiness in the First National Park, which chronicles upwards of three hundred fatalities in the park. In his four decades in Yellowstone, Fuller has had countless close calls with lightning, with wildfire, and with blizzards that forced him to bivouac miles from the nearest human. During Yellowstone’s 1988 fires, trees burned to within feet of his cabin door. He has busted skis and had snowmobiles break down when he’s been miles from safety and shelter and temperatures are fifty degrees below zero. Then there was a grizzly bear incident in Hayden Valley. This story begins with the death of Fuller’s beloved horse, Ishiwah, with whom he had covered and explored thousands of miles of Yellowstone’s backcountry over eighteen years. “Ishiwah was as in tune with Yellowstone as I was,” Fuller says. “Together, we were a centaur. Next to my family, he was my most valued companion. Some of my most memorable photographs were taken from a saddle on his back or from the vantage of terrain we went to together. Nothing rattled him, not lightning and thunder, not people doing crazy things, not grizzly bears, or a fool hen flying in his face.” Ishiwah died in 2002 in an accident in his winter pasture outside Yellowstone. Fuller was in Africa at the time and, when he returned, was devastated. “I dream of meeting him on the other side,” Fuller says. Ishiwah’s passing meant that in the summer of 2005, when Fuller entered the mouth of Nymph Canyon, deep in Hayden Valley, he did so riding a newish horse, Rivers. The two had been exploring together only since 2002 and hadn’t yet morphed into a centaur. As the duo made their way up the canyon, a short distance in front of them, without warning, a four-hundred-pound grizzly, startled by their approach, rose from its daybed. As the furry mass lumbered to full height and growled, its ears pinched back, Rivers, terrified, flipped over backwards. Fuller rolled free and, unhurt but shaken, got to his feet, bracing for the bear’s onslaught. He expected it to be upon him in a few seconds. As the dust cleared, though, Fuller saw the grizzly was gone. Rivers was, too. Fuller was alone. After searching and finding Rivers on a sagebrush flat more than a mile away, Fuller walked the five and a half miles home, leading the traumatized horse. Back at his cabin, Fuller drank beer to unwind. Rivers, however, has never been the same. He knows the answer. There is no other place like his Yellowstone home. — Todd Wilkinson, who has been writing about the West for more than a quarter-century, is author of the critically acclaimed book Last Stand: Ted Turner’s Quest to Save a Troubled Planet.